CAIRO — It’s almost 7 a.m. on a Tuesday, a workday in most parts of the world. But the sidewalks and alleys of Cairo are already occupied by working-age men without employment who spend long hours at small, local cafés just trying to kill time. In a country with a youth unemployment rate above 30 percent, a highly restrictive political climate and an economy only now creeping back to levels seen before the 2011 uprising, these young men say the prospects of finding jobs are grim — even for those who have completed higher-level education. And yet a rising class of entrepreneurs say virtually every problem and deficiency that exists in Egypt — traffic congestion, garbage pileups, power shortages — and the failure of the government to address those issues and provide critical services has left the door open for youth-led startup companies to provide solutions. Shahir George, 24, who visits the cafés for leisure, finished his university studies in business in 2011 and then spent a year performing mandatory military service. He joined Bey2ollak, a small enterprise that provides mobile traffic updates, despite his family’s fears and objections that binding his future to a startup was too risky. George said taking a risk and then finding success with this job has been a dream come true, but he knows he remains in rare company. He’s concerned about friends and acquaintances still killing time over tea and tobacco. “Nobody here cares about having the job of their dreams anymore,” he said. Bey2ollak’s team doesn’t think that way. Its mobile application launched in October 2010, gathering about 6,000 users in the first few days of launch. Working from a bare-bones but creatively adorned office in the upscale neighborhood of Maadi, a group of tech-savvies relentlessly upgraded the platform to support a growing user base. After signing early sponsors like Vodafone and winning $200,000 in seed capital from Google in 2012, Bey2ollak has now reached 1 million registered users with advertisers like Hyundai and the FIFA World Cup. It employs 30 young employees from different disciplines and has expanded to Alexandria, where George serves as a marketing specialist and operations manager, he said. Hisham El-Rouby, founder and CEO of Etijah Foundation, a prominent entrepreneurial incubator in Egypt, is trying to create more successes for the country’s youth. He said burgeoning entrepreneurship offers a possible antidote to Egypt’s youth unemployment crisis. An estimated 3.6 million Egyptians are entrepreneurially active, 1.4 million of whom are nascent entrepreneurs, 2.2 million are owners of new firms, and 1.9 million are owners of established businesses, according to a report issued by Global Entrepreneurship Monitor in 2013. Reforms implemented under Hosni Mubarak in the 2000s made it easier for young Egyptians to launch companies, and Egypt enjoyed some global fanfare as one of the most enterprising countries in the Middle East. El-Rouby argues that entrepreneurs are in better position than established businesses to secure highly competitive investment opportunities, and he advocates government incentives like tax exemptions for startups as rewards for hiring the unemployed. In addition to navigating Egypt’s notorious bureaucracy, startup founders are tasked with creating a cultural change. But instability has been an inseparable part of Egypt since 2011, and entrepreneurial teams like Bey2ollak’s have actually been able to capitalize on that. Nearly four hundred kilometers southwest of Cairo, deep in the desert, is the Bahariya Oasis. Thousands of young men of rural villages in this part of Egypt work in farming or construction, but both fields are facing enormous economic challenges and cutting employees. After trying his luck in Cairo and failing to find work, the Bahariya Oasis is where Ahmed Hamdy, 25, found his first-ever job at the startup company Karm Solar five months ago. Karm Solar started in October 2011 and offers an alternative energy option to Egyptians who live off of the electrical grid. Ahmed Zahran, the company’s CEO, has a different vision for this part of the country. 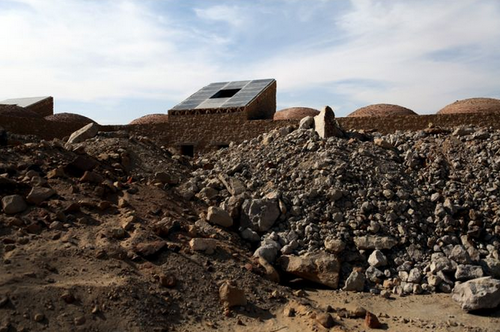 He the desert is one of the country’s forgotten resources and that Karm Solar is almost done building a village entirely made of earth materials and will totally rely on solar energy for electricity and water pumping. Indeed, though power outages are common back in Cairo, they are not at Karm Solar. Zahran explained that water and electricity for the whole campus is based on energy from the arrays of solar panels installed just feet out into the desert. The village Zahran and his team are building will be the first of its kind in the Middle East/North Africa region and eventually home for 500 workers of nearby farms and construction sites, said Zahran, 34. The company began as a small team of four, along with an executive board of experts on renewable energy. Board members actively invest their savings and ideas in the project in exchange for contributing to the company’s business decisions. Zahran said it wasn’t easy to give up his previous job at a multinational company in the energy sector and start his own business. The startup life requires some sacrifices. Heading back into southern Cairo, illicit residential buildings cover green fields all over the ring highway road that connects several districts of the city. Egypt ranked first among countries with the largest rate of desertification of green fields, according to a UN report. Security unrest during the past three years has made it easier for squatter to build stealthily on the agricultural fields, which has resulted in severely diminishing agricultural activities across several provinces. Painfully aware of Egypt’s marginalized community of farmers, Laura Tabet co-founded, ‘Nawaya’ — or ‘Seeds’ — based in Giza, southern Cairo. Tabet lost her job a few months after the 2011 uprisings and, inspired by the promise of the revolution, she teamed up with two other entrepreneurs to start an educational center that introduces new agricultural techniques, bringing together volunteers from different competencies. “Our aim is to empower farmers to overcome their own challenges instead of blaming the government,” she noted. It’s the kind of mentality that Egyptian entrepreneurs working on internet, energy, agriculture and other fields all seem to share. Ahmed Ragab, managing editor of the Al-Masry Al-Youm website, contributed to this report.